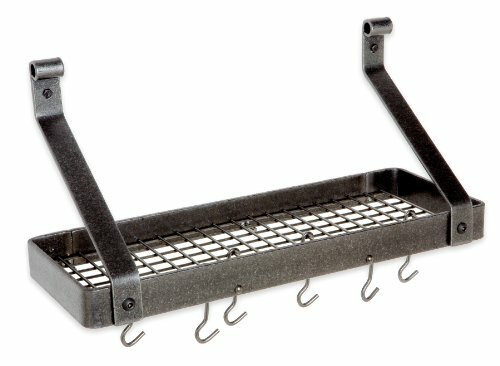 EFFICIENT SPACE SAVER – Unique shelving solution for reducing clutter in the living room, office, kitchen and more; Ideal for displaying your favorite collectibles and decorative item. 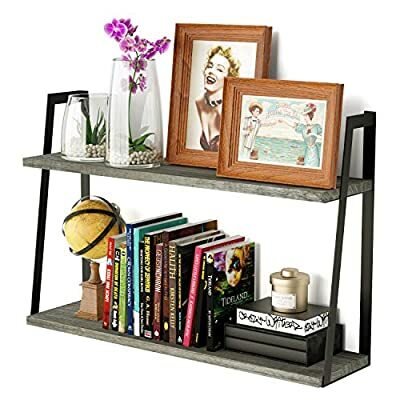 ENHANCE YOUR WALL DECOR – Add a retro design element to your home decor through weathered grey wood and industrial metal brackets; Great to accent your treasured memories. 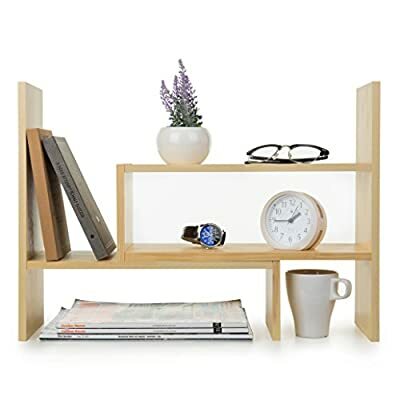 DURABLE WITH AMPLE STORAGE – Lightweight but solid wood holding about 50 lb will stand the test of time; 2-tier shelf with a vertical spacing of 10.3” offers more storage space. Vintage rustic wall hanging shelves with distressed whitewash finish. Features 3 cascading tiered shelves with pallet inspired design. Perfect for any room, office or retail setting for collectibles, potted plants, knickknacks and so much more. Features 2 separate pieces that can be pushed close together to create a small shelf rack, pulled further apart to create a longer shelf, or set together at any angle you choose to best fit your space and your style. 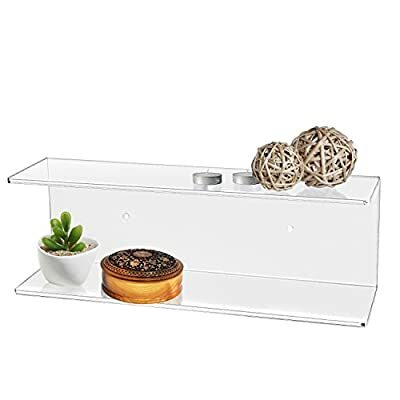 The modern efficiency and clear acrylic class of this shelf brings stylish organization to any wall space in your home. 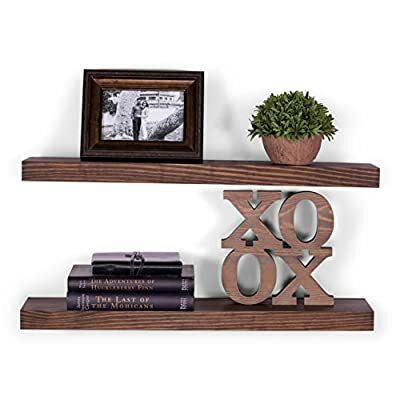 Features dual tiers making this functional shelf easy to display your favorite things. 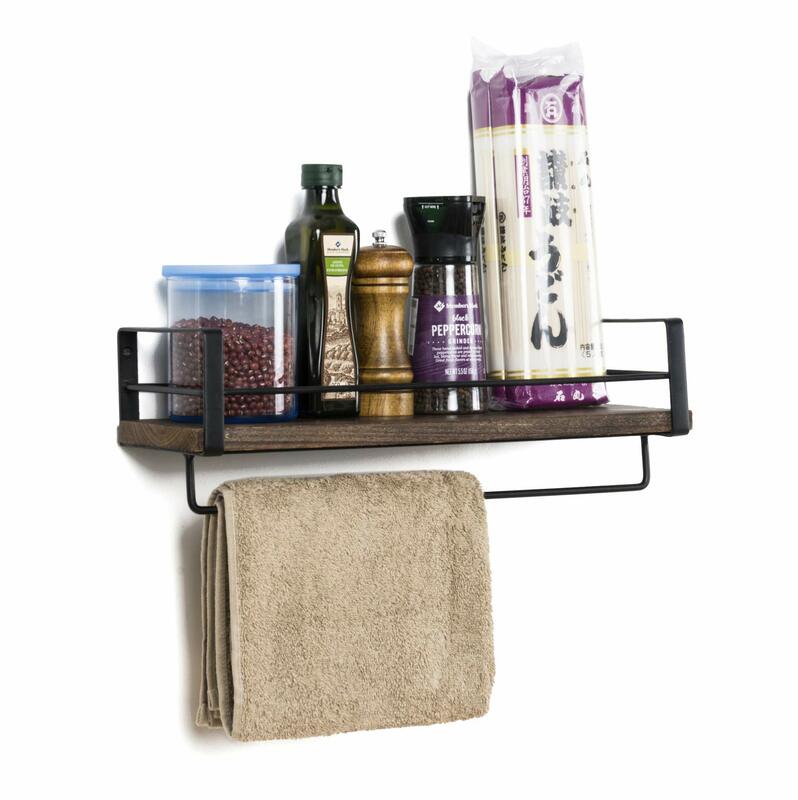 Makes for a perfect organizer set for cosmetics in bathrooms, spices in kitchens, and decorations in bedrooms. 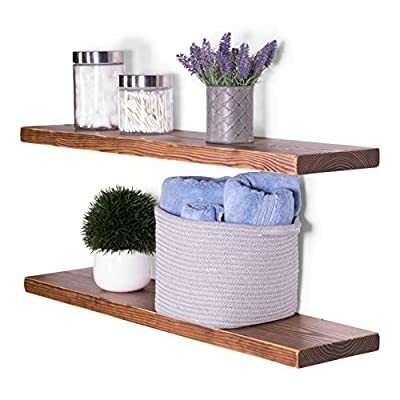 ORIGINAL ART:100% solid Wood.Unique hand crafted.This set Rustic wooden floating shelves will add charm and usable storage to any space. ORGANIZE AND DECOR：Not just a floating shlef can be used as displays for small decor objects, or for storing beauty products, spices, but aslo add a touch of farmhouse decor on a blank wall. JUST FOR BEST SHELF:We put our heart on selecting wood,joint, plane, route,color. For us there is nothing worse then a flimsy low quality product, so we pay extra attention to the construction of all our products. 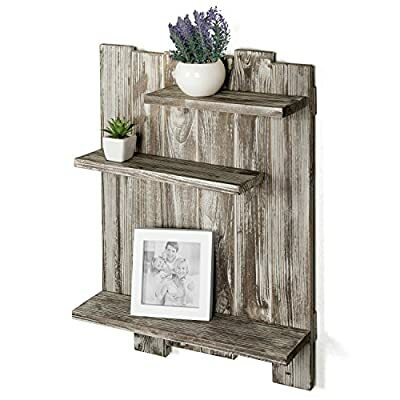 ➤STURDY STRUCTURE- Simple design rustic wood shelves constructed of solid paulownia wood boards and powder coated metal brackets.Lightweight but solid wood can holds up to 50 lbs. 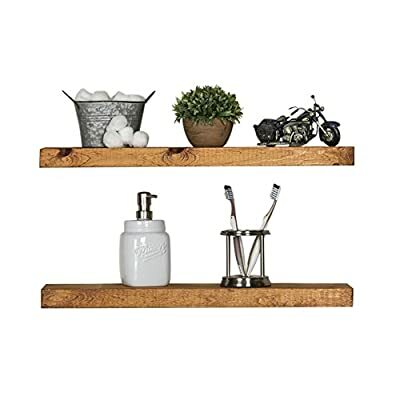 ➤EFFICIENT SPACE SAVER – Our rustic wood wall shelf offers a large space for storage and can display in your kitchen, living room, bedroom, bathroom, entryway and more. 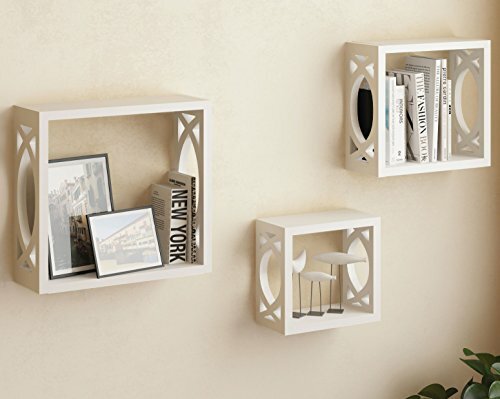 Creates ample shelf space in unused areas of the home,perfect solution for compact areas. 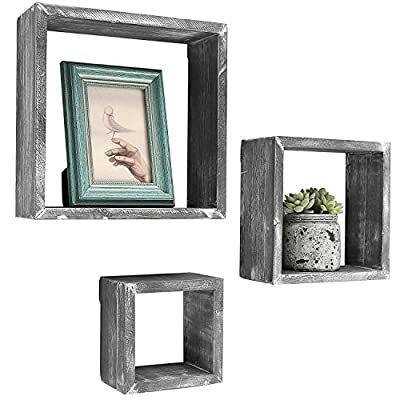 Set of 3 interlocking wooden wall-mounted shadow boxes. A country rustic style unique wall mounted wood shelf in a light torched wood finish. 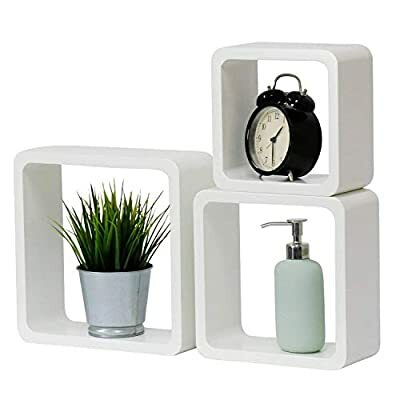 The geometric shelf design is composed of 3 overlying rectangular boxes. 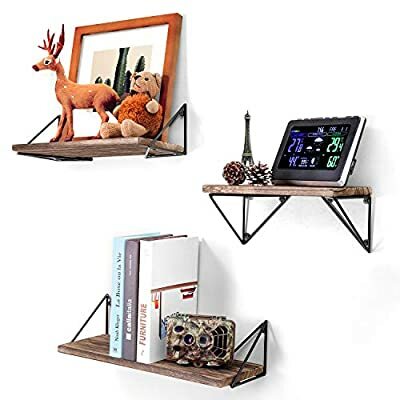 ♥VERSATILE AND UNQIUE LOOK: You have the option to group the shelves together or hang separately for the perfect accent for any room; these shelves will hang flush against the wall. ✔ SOLD BY DIY CARTEL – Custom look, DIY Budget: Why pay more when you can do it yourself for less? 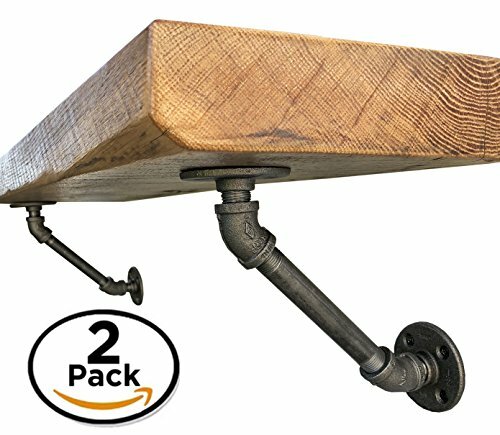 Your set comes with 4 flanges, 2 x 6-inch pipe, 4 x 45-degree elbow, and 4 x close pipes for a one-of-a-kind industrial pipe shelf. ✔ Industrial Strength Construction: Tired of flimsy shelves? This heavy-duty hardware is crafted from raw, black malleable iron. Perfect for display shelves or holding up a counter top/bar. ✔ Easy to Install & Reusable: Put them up in minutes. Your metal shelf brackets can be reused throughout any room in your home or business. 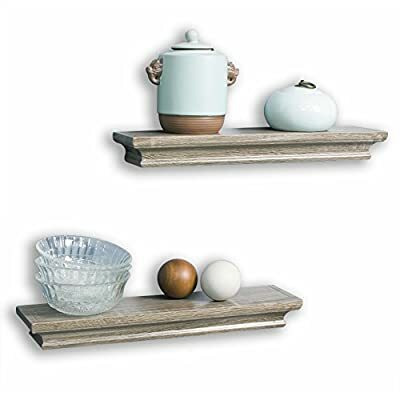 【Attractive Storage Shelves】: Reorganize your home and free countertops from clutter with these cute floating shelves. 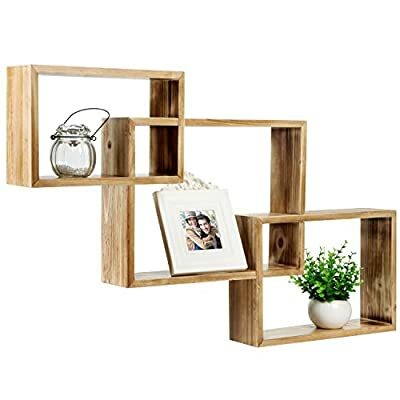 Composed of solid Paulownia wood boards and matte metal brackets, our functional wall shelves add a decorative touch to your wall while also creating versatile storage space to store and reorganize small items. Perfect for bathroom, bedroom, living room, kitchen, and more. 【Suitable for any contemporary house】: Designed with torched finish wood and industrial triangle metal brackets, the floating shelves not only enhance the aesthetic flare of any contemporary household, but also serve as a delightful decoration fitting to any design styles of a room. Buy one or two sets together to fill an empty wall space and display items as you like. 【Sturdier and Easy to Install】: Large: 16.5×6×4.8 inches; Medium: 14.2×6×4.8 inches; Small: 11.4×6×4.8 inches. 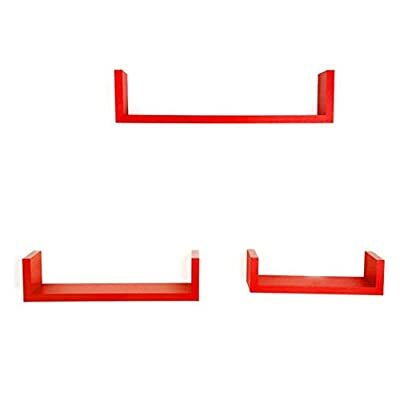 These wall shelves are wider and sturdier than competitor’s options. Strong enough to hold photos, collectibles, books, treasures, art, small plants, trophies and more. Easy to assemble with all necessary hardware included; you just need to follow the instruction steps and you can install in minutes. 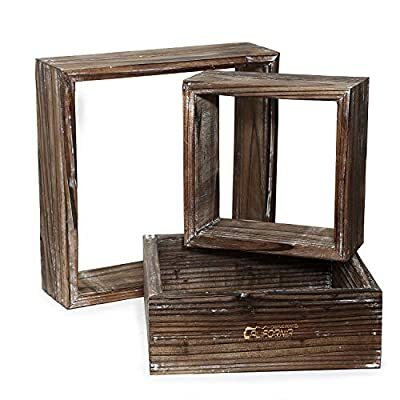 Set of 3 freestanding or wall-mountable wooden shadow boxes with a rustic barnwood-gray finish. Can be used to showcase keepsakes, collectibles, and awards, or for creating unique decorative displays. Each display shelf comes in a different size and can be grouped together to created a decorative wall collage or used separately. 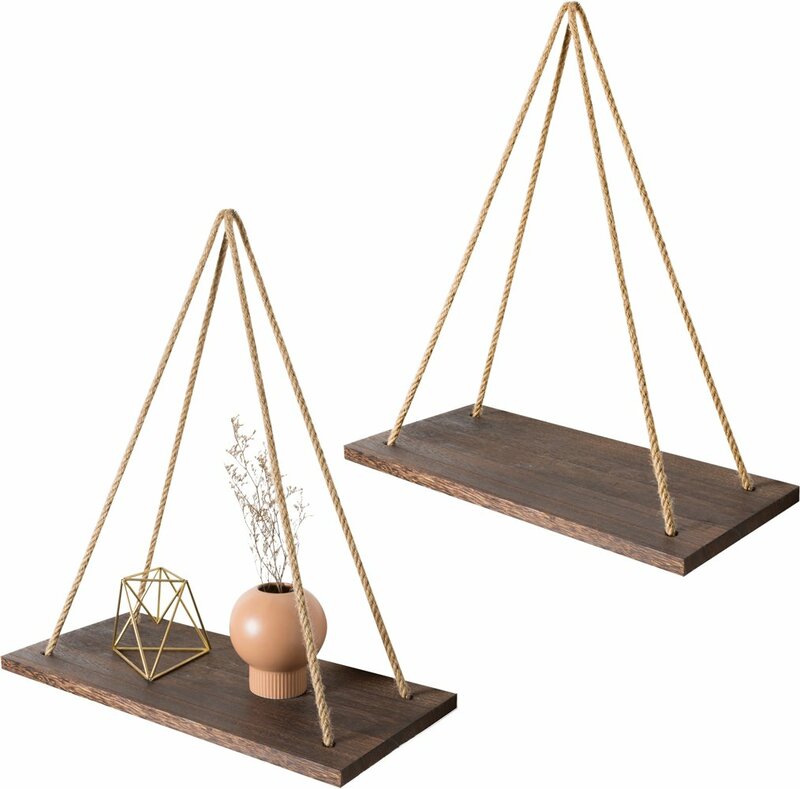 ✔ Home decor & organizer- Set of 2 wood hanging shelves are the perfect piece for any rustic, modern, or natural home decor. Hung with natural jute, they have a unique, rustic charm. They allow to better organize spaces and to put all sorts of things on display. They are perfect choice for adding additional shelving space for collectibles, plants, crafts, photos and more. Their simplicity makes them versatile! 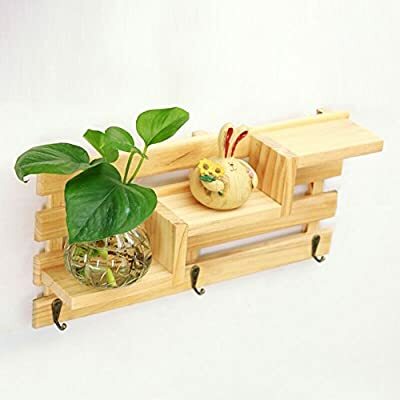 ✔ Premium quality wall shelves- Made of paulownia wood, jute rope,The wood board is under anti-mildew treatment so it can not be moldy.Perfect for displaying potted plants, family photos, collectibles and so much more. The props in the picture are not included. 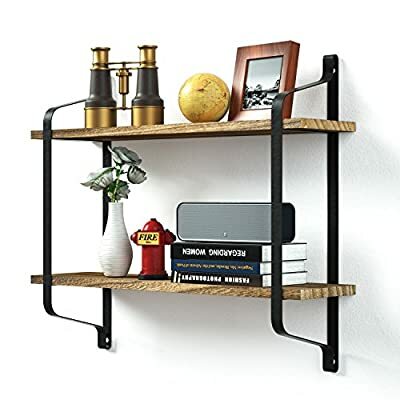 ✔ multipurpose floating shelves- Rope hanging shelves are great wood wall decor for your kitchen dining room, living room, bedroom, farmhouse, apartment, dorm room, or office. Alternatively, they can be hung on the wall, in front of a window, on the window or on a terrace, indoor or outdoor. Made of MDF & laminate, it is not real wood, Approximate Dimensions: Large: 17 x 4 x 4″. Medium: 13 x 4 x 3.5″. Small: 9 x 4 x 3″. 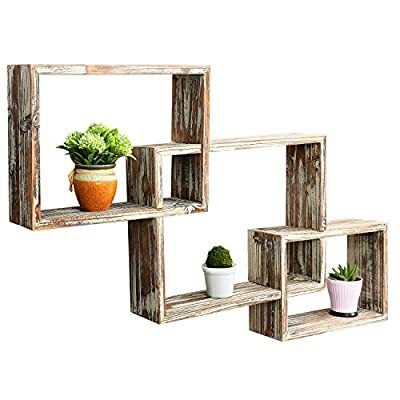 WALL DECOR RUSTIC SHELVES – Made of solid wood and process with torched finish, a rustic shelves to dispaly your collectibles, small plants, stuffed animals, a great decorative addition in any wall. 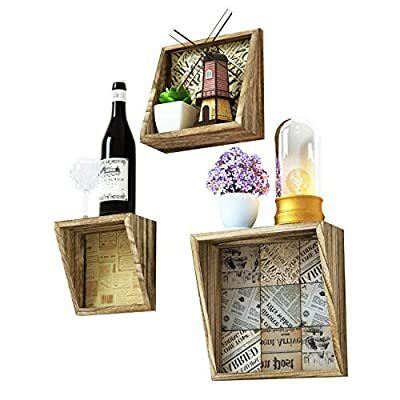 BEVELLED DESIGN and Old NEWSPAPER STYLE – Different from most traditional square shelves, this farmhouse shelf designed with bevel appearance and 3 paper board in old newspaper style, unique and decorative.